The Jordan River Watershed is located in north central Utah and drains an area of over 3,800 square miles. Elevations range from 11,900 feet in the Wasatch Range, to 4,200 feet where Jordan River drains into the Great Salt Lake. The Jordan River flows north from Utah Lake to the Great Salt Lake. Some of the other major contributing bodies of water in the area are the American Fork River, Provo River, Mill Creek, Hobble Creek, and Spanish Fork River. Major water uses in the area include agriculture, irrigation, municipal and industrial uses, and recreation. 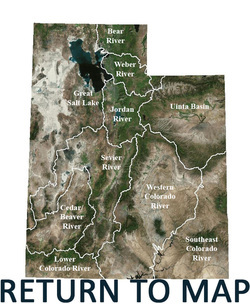 Much of the water in the streams is diverted for consumption, so to support the large and growing population, artificial supplies of water have been diverted from the Uintah Basin into the Jordan River Watershed. Average precipitation ranges from 12 inches per year in the lower valleys to over 50 inches per year in the higher elevations. Much of the precipitation comes down as snow which contributes to the rivers in snowmelt during the spring. Water quality issues include metals, total dissolved solids, E. coli, high water temperatures, high levels of ammonia, and low dissolved oxygen. Major pollutant sources include: failing septic systems, industrial discharges, illegal dumping, equipment cleaning, agriculture, and stormwater from roads and parking lots.